These three roads comprise an estate of 76 houses, which lies just to the west of Ash Road by Hoselands Hill. 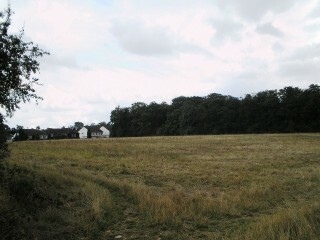 They have a pleasant location with woodland, parkland and farmland to the west and north. The roads are also notable for the lack of street furniture such as telegraph poles. They were mostly built in 1975-79, the exceptions being 9-11a Downs Valley, which were built on the back garden of Westfield Lodge, Ash Road, in 1999. The land was developed by F C Starke Limited, a company owned by local developer, Ron Billings (1903-1991). Mr Billings had acquired a lot of land in Hartley in the 1950s. on 30 June 1953 he purchased the land forming Downs Valley and Old Downs road, along with land extending down to the Fawkham Valley Road for £6,000. This was about twice the average agricultural land price of £56 per acre, so its development potential must have been recognised. He acquired the remaining part of the estate, including the crucial land to build an access from Ash Road, for £8,850 from WT Everard & Co Ltd by transfers dated 3 October 1963 and 5 June 1964. In 1953 he applied to build on it. 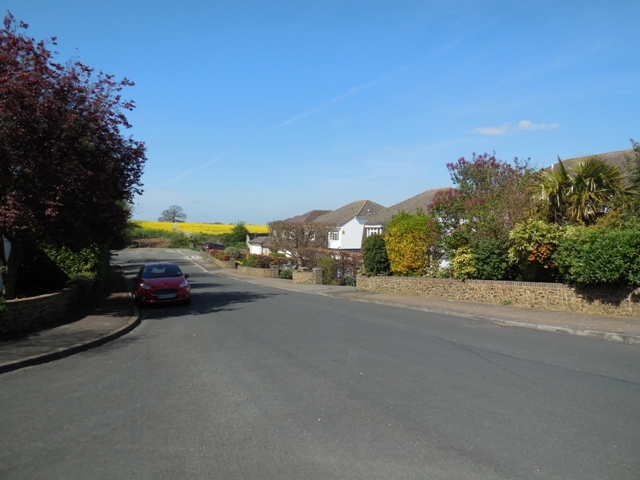 As well as this estate this would have resulted in houses at the end of Fairby Lane, Bramblefield and on Steep Hill all the way to Miss Bignold's school (Planning application 53/254). Dartford Rural District Council refused most of this but he was allowed to build Old Downs road and the houses on that side of Ash Road between the Church Road. 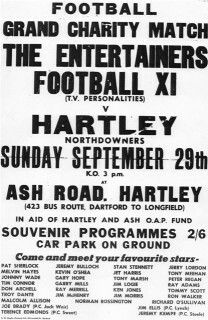 Little is known about the use of the land at the time, but Mr Billings allowed Hartley Northdowners Football Club to play on the meadow there and to build a club house in 1963. 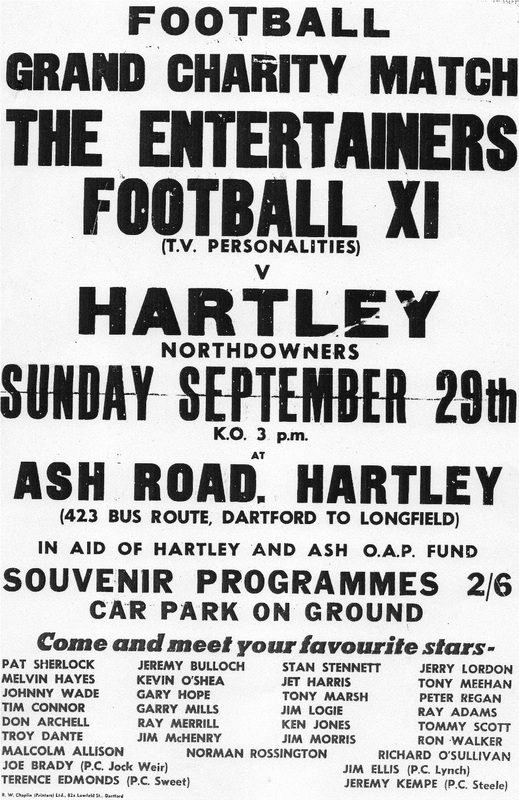 An undated poster announces a charity match with a team of celebrities for the Hartley and Ash OAP fund. The celebrities featured names such as Malcolm Allison, Richard O'Sullivan, Melvyn Hayes and Jet Harris (from the Shadows) as well as a number from the then hit TV series Z-Cars. Meanwhile the district plan had evolved and Downs Valley lay outside the development area. In 1972 the company said their financial viability was at risk if they weren't allowed to build here (Dartford Chronicle 10.3.1972). As a result of their representations the land was removed from the green belt. Building began in 1975; the local paper reported that a 10 year old child was rescued safely from a drainage shaft, fortunately his friend was able to raise the alarm (Dartford Chronicle 7.8.1975). Going back in time the fields that once made up this estate were part of either Fairby Farm or the Church Glebe. (1) Planning Permission: 2012/2904 Extension to detached garage and widening of existing driveway entrance. (1) Planning Permission: 2014/3454 Removal/ variation of condition 5 (permeable hardstanding) of planning permission SE/12/02904/HOUSE. 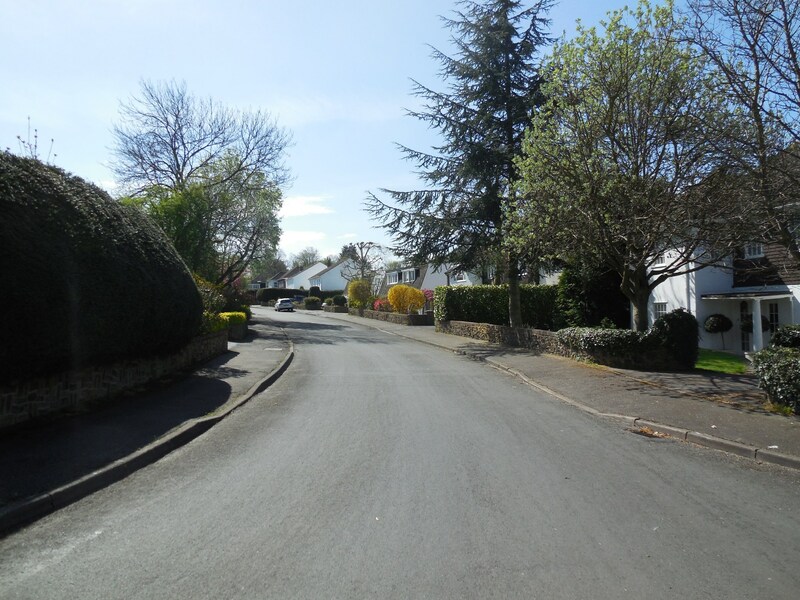 (1) Planning Permission: 2014/1696 Prior notification of a single storey rear extension which extends 5m beyond the rear wall of the original dwelling house with a maximum height of 3.2m and eaves height of 2.2m. (1) Planning Permission: 2012/2714 Remove window to rear of property and replace with french doors, remove large window to the side, partial blocking up and installation of exterior door. (1) Planning Permission: 2014/1957 Canopy to rear elevation and pitched roof to existing detached garage.